Am I the only guy who doesn't have a movie trailer? This week it sure feels like it. 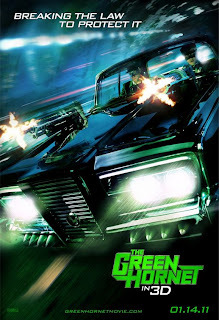 Rounding out a week of trailers for green themed heroes and cowboy and alien posses, comes the latest gang-busting trailer for classic pulp-icon The Green Hornet and his faithful yet deadly sidekick Kato. I'm a pretty big fan of Seth Rogen (The Hornet) films, so my popcorn, soda and seat for this film are as good as booked. You though, if you're still on the fence, might need to make with the clicky. We'll have to agree to disagree on this one. Not really a Rogen fan myself. I'll see it, but I'll probably wait until it hits the Red Box and pick it up for $1. I am completely on board with you about Seth Rogan films, Dan, so I've been looking forward to this for a while. And the trailer did nothing to discourage me from wanting to see it. It looks wonderful! And the actor playing Kato looks like he did a wonderful job, at least in the clips. I hope it carries through the entire movie. Either way, Seth Rogan rarely fails to entertain. And isn't that what we ask from our movies? Entertainment? When did we all become art house critics? Random, who better to review and report on movies than the people you know love the same movies you do? And I agree Jay Chou looks amazing in this role. If anything, I'm seeing this movie for him. I've just never saw the humor in Rogen or his performances. I'm a fan of the Stooges, Farley and Spade, Carrey and Daniels. My taste in humor is about as low and simple as you can get, so I may not be the best judge. You're a great judge Craig - hearing what everyone loves and hates is the best part about the whole blog/commenting thing! When all these films come out I will be doin my reviews of them here on IADW and hopefully folks will add their their thoughts to the review too. Me, my favourite form of comedy is really cheap slapstick so this trailer already had me laughing. And I completely agree Random who cares if the film isn't always art house standard? Most of my most watched films aren't at that level, but it's good to just chuck em in the DVD player and know you'll either get a laugh or three from doing so. What are some of the movies folks like best? Cderosby, my comment really wasn't directed at you, and I'm sorry, I should have made that clearer. Sometimes what I post on here is a furtherance of a conversation I've had somewhere else. Everyone, of course, is completely entitled to who they think is funny. I personally, do not find the Stooges funny. (Insert collective gasp) At least you'll watch the movie when it's available to rent, which is more than I can say for some people. Again, I apologize. And I agree completely about who to listen to than those people who love and watch the same movies you do. Random no apology needed. Everybody's got their own tastes and I got used to the fact that mine can be out in left field years ago. You're welcome to come on over to our site anytime. And Dan, I knew there was a reason you hit it off so well with my brothers and I.